As anyone who knows me will tell you, when it comes to backups I'm a belt & suspenders sort of guy. In fact, add in a rope & duct tape as well. In the past I've covered some of my backup software choices as well as some choices for backup destination. Today I'd like to remind you that not all your critical data resides on your computer and that data needs to be backed up as well. If you are like most Apple users you probably have a Mac or two, an iPhone and maybe an iPad, an Airport, a printer and maybe even a NAS. If you took my advice you already backup your Macs and if you configured your iPhones & iPads correctly they will either backup to iCloud or to your Mac when you plug them in. But what about your Airport, printer or NAS? Do you back up those configuration files? Trust me, if they fail recreating those configuration files can be a real pain so why not have a backup? Let's start with the AirPort. If you use another brand of router the method might change but backing them up is just as important. 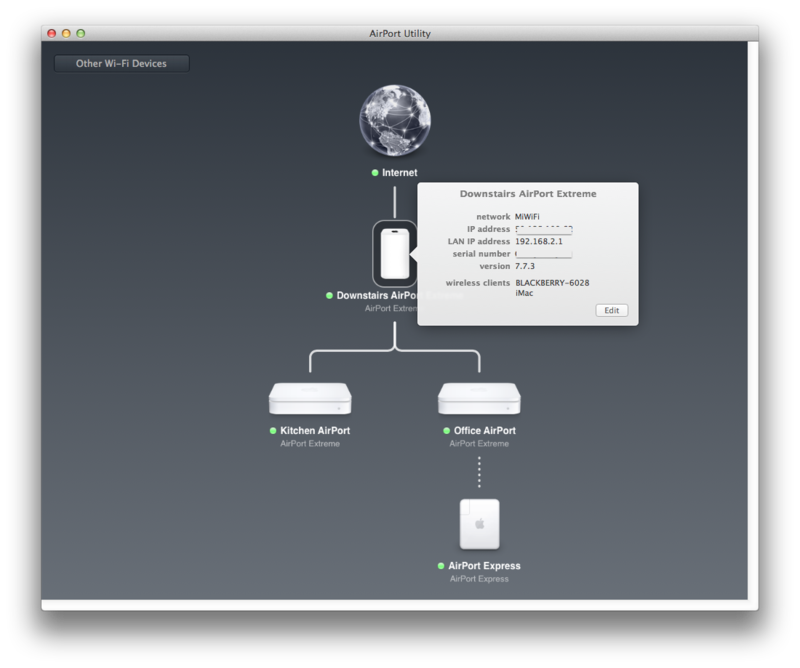 Open up the Airport Utility. This application is usually located in the Utilities folder. Select the main Airport and click "edit"
A drop down window will then show up but don't edit or change anything. Just go to the menu and select "File" the "Export Configuration File ..." Make sure to save that file where you can access it later if you need it. If you store it on your Mac the file will be automatically included in your normal daily Mac Backups and your Monthly backups. You do back up monthly and store a copy offsite don't you? Save the file and quit the application. Should you ever need to restore the file just use the same steps and use the "Import Configuration File ..." selection. If you have taken the plunge into the NAS world you will want to make sure you have a copy of your NAS configuration file. How you back this file up depends on the type of NAS you have. Since I have a Synology NAS I'll show you how to back that file up. If you have another type of NAS just refer to the manual. Remember RTFM is a motto to live by. Log into your webpage as admin and open the control panel. Make your way to "Update & Restore" and select the "Configuration Backup" tab. hit the "Back up configuration" button and save the file. As you can see it will back up settings that you spent a lot of time configuring. 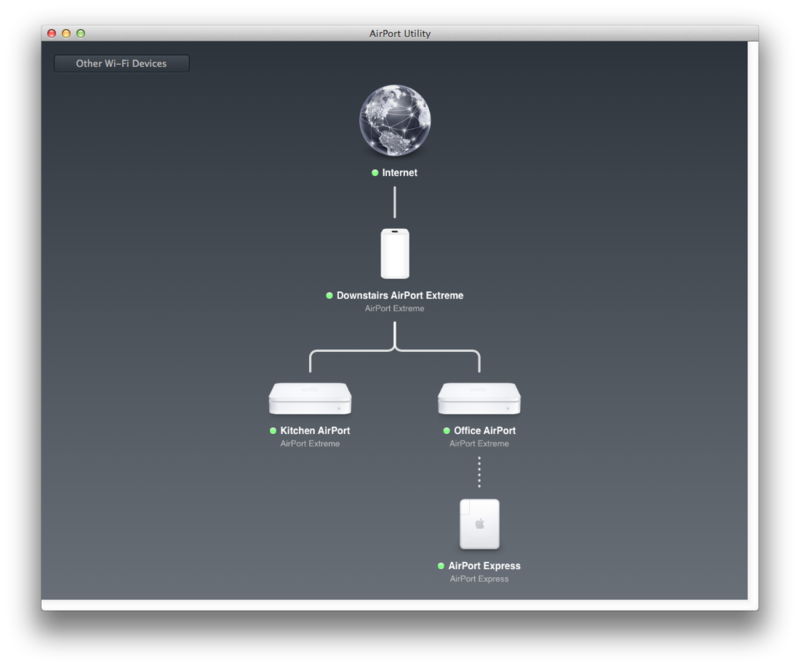 If you have a complex network you may have a switch in addition to your Airport or other router. In my case I have a Cisco network switch. Because this is a an active switch I have spent some time setting it up and configuring it. If you have a configurable switch you can log in via the web interface and back it up. 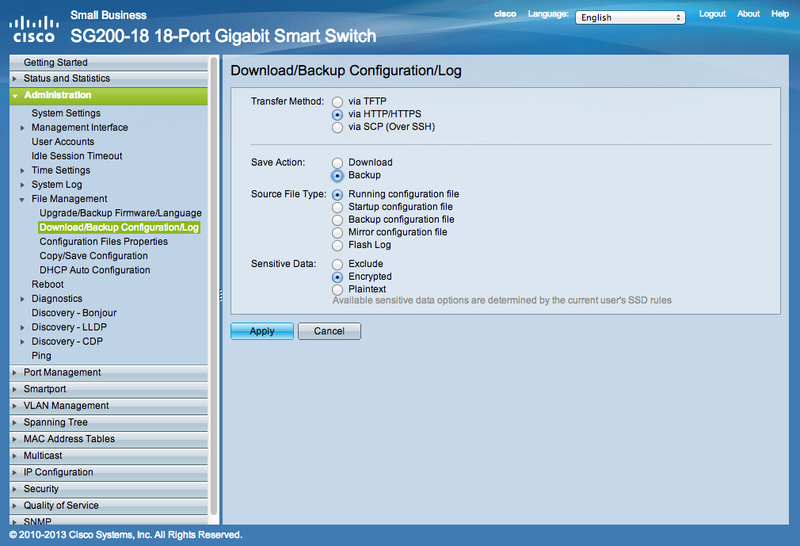 In the case of my Cisco switch it's as simple as selecting the "Download Backup Configuration" under File Management and selecting the Backup option. Again, save the file on your Mac under a directory that you can find later. 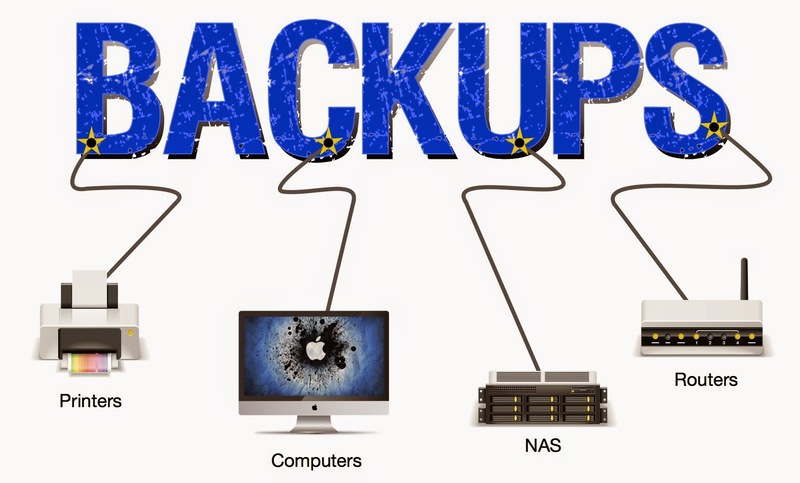 When your Mac does it's backup you will also include a backup of all your other devices as well. A backup of a backup if you will. Did you know that some printers are configurable via a web interface? My Brother Laser printer is. 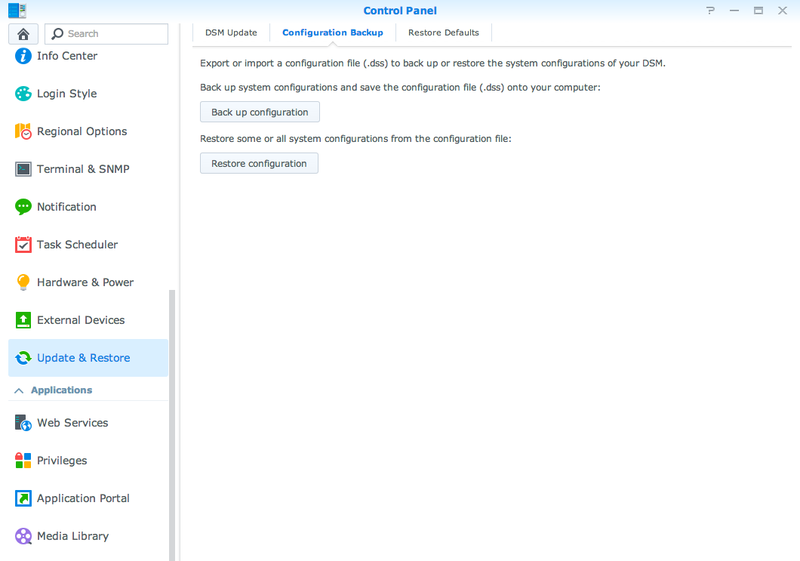 Although there isn't a file you can back up you can do multiple screen shots of your configuration to help you if you need to re-run the configuration. Save the screen shot in your backups folder so you can use it later or use a notes or password storage application. Backing up information isn't just duplicating configuration files. Sometimes you need to record important information in case you need to set up or re-do a set up for applications. Can you rattle off the SMTP and IMAP server names for all your email accounts? 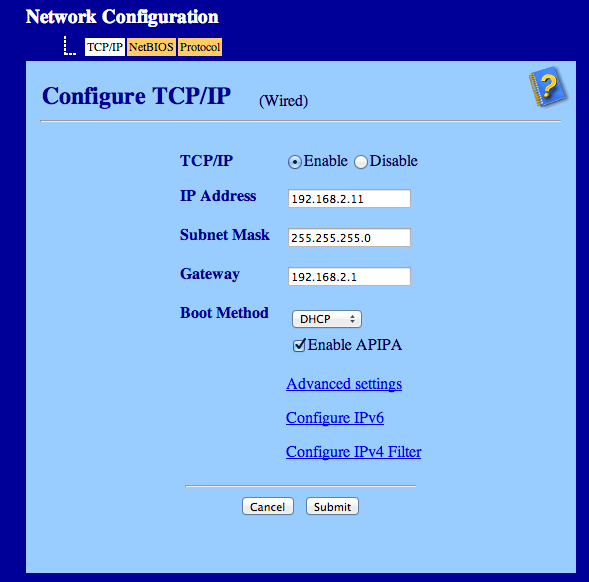 What about the VPN or VNC information you use on a regular or semi-regular basis? All this information should be backed up and stored. Because of security concerns please don't use paper. For one it's just too easy to loose. So what should you use? 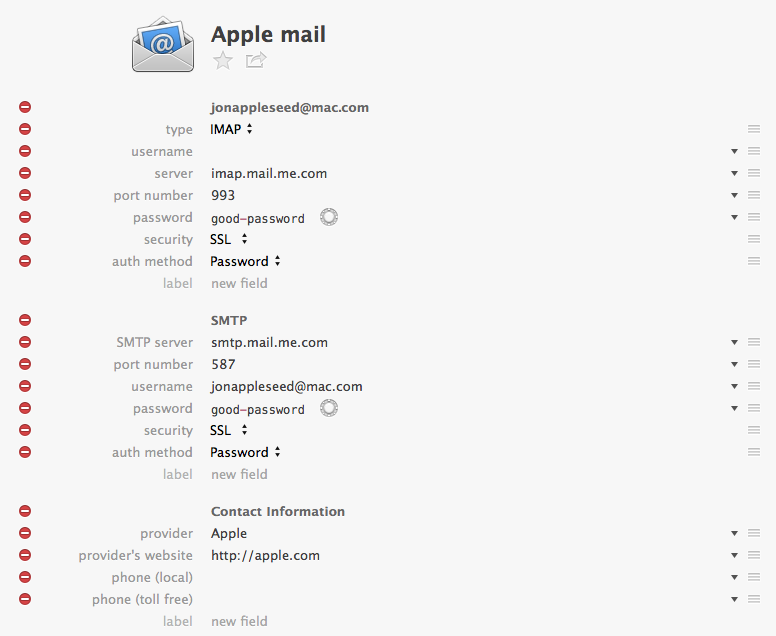 I recommend an application like 1Password or SplashID. They aren't just for passwords any more. There are other apps that do the same thing but these password/information storage applications are secure and work well for me. Some data is just too important to risk loosing. Other data is just a pain to reenter or reconfigure. Either way you need to back up. If you do so on a regular basis or when you buy something or get a new account, then it won't be too onerous a task. But don't look at your data and think it's just too much. If you only back up one account or item per day then you will at least be making a start. And with anything, small steps will start you on your way and overcome your procrastination.